Mass-spring systems are considered the simplest and most intuitive of all deformable models. They are computationally efficient, and can handle large deformations with ease. But they suffer several intrinsic limitations like the difficulties in controlling anisotropy, springs functions parameterization and enforcing volume preservation. As part of this project, a modified mass-spring system that addresses these problems and solves them elegantly was developed. The modeling framework was used for modeling breast mechanics, heart mechanics and for elastic registration. Modeling breast elasto-mechanics is an active research field. Many research teams are investigating the use of breast modeling in various clinical applications. 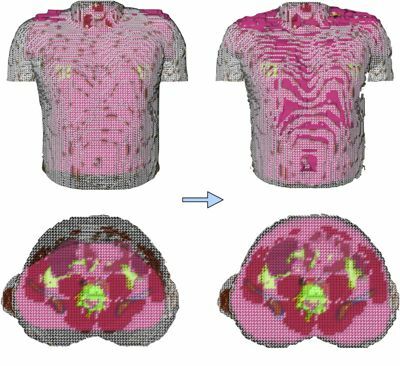 To obtain breast phantoms suitable for developing microwave imaging systems, the modeling framework is used to simulate the deformation of MRI breast phantoms from prone to supine positions. Modeling heart elasto-mechanics offers the possibility to search for better diagnostic strategies and for investigating new therapy approaches. The modified mass-spring system is used to simulate the left and right ventricles mechanical properties and contraction. The model includes the strong anisotropies of the myocardial tissue mainly in fiber directions, nonlinear passive properties and the constant volume of the myocardium during deformation. Elastic 3D Images Registration is an ill-posed problem. Thus, a direct solution is impossible. Image registration must take the properties of imaged data into account, like anisotropies and heterogeneities. A general approach to image registration is based on a similarity measure, that drives the registration, and a regularization process that controls it. The iterative closest point algorithm (ICP) is used as a similarity measure in combination with the mechanical modeling framework that regulates the deformation field.